Let. Me. Tell. You. Tulum is every bit as amazing as everyone says it is. After the minor setback of finding out that our airline had gone out of business the nice folks at Interjet (never heard of them I know, but they were great) were able to squeak us onto a flight that departed just 30 minutes after our now non-existent flight. After landing in Cancun we rented a car (highly recommended) and drove to Tulum where we checked into Papaya Playa. After that it was all mojtos, cenotes, Mayan ruins and pristine beaches. This little town in Rivera Maya should definitely be in your travel list! Never stop exploring!! The old man's 60th birthday in Park City, Utah was an amazing success! We skied, we ate, we conquered! Friday was an amazing day at Deer Valley Resort followed by an incredible dinner at Apex at the Montage. Saturday, we tore up over 7,000 acres at Park City Resort and then hit historic Main Street for an out of this world dinner at Handle, highly recommended! Superbowl Sunday did not disappoint with a gorgeous morning of skiing followed by a broncos win! It was a great way to turn 60 and we made some memories that will last forever. Can you guess what snacks will be accompanying us on the 8 hour drive? Giddy Up! Giddy Up Nuts is so excited to call two amazing local shops in the Northern California area home! You can now get your Giddy Up Fix at Shoppers Corner in Santa Cruz and Mar-Val in Groveland. See our Stockist page for address details. Both stores feature amazing local products and produce, check them out! Last weekend Giddy Up Nuts had the pleasure of participating in the Artisanal LA Holiday Shop in Old Town Pasadena. It was such a great event and was so much fun to meet all of our customers and sample some of our delicious flavored almonds and offer these awesome holiday gift crates. Apparently they tasted pretty darn good because we SOLD OUT!! We thank you so all so much for your support and it always stokes our fire to get that positive feedback. Our holiday crate supply is replenished and back in stock so be sure to visit the online store today to get yours in time for that special foodie on your holiday list or that perfect hostess (because don't get us wrong, we always love a good bottle of wine but don't you want to be that guest that stands out from the crowd?) Each crate comes with a trio of flavors and is wrapped perfectly for the holidays. Order yours today! Giddy Up Nuts is so very excited to announce that we can now be found at the beautiful Bacara Resort and Spa in Santa Barbara, CA! This is huge news for us as the resort is a beautiful property and a place that holds great sentimental value to us. You can find us with the dogs every Memorial Day weekend at Bacara and on that occasional day trip to Los Olivos when we have had a little to much vino. Find Giddy Up at The Blend at Bacara! Despite the soaring temperatures here in Los Angeles (it's 106 today!!) the unofficial start of fall has happened. How you say? The return of Pumpkin Spice fever!! That's right, the PSL is back at Starbucks which commemorates that time of the year when we Los Angelenos break out the boots and scarves despite the Indian Summer like weather. Get your pumpkin spice fix this season with Giddy Up Nuts' Pumpkin Spice seasonal flavor! All the flavor of your favorite pie with no guilt!! Order your bags of seasonal Pumpkin Spice now!! Giddy Up Nuts has some new real estate! Come visit SunLife Organics in Calabasas for some some delicious smoothies and bowls and while you are there pick up a bag of Giddy Up Nuts. We are so excited to have placement at this new retailer and can't wait to come to the other SunLife locations. Giddy Up Nuts is proud to be a part of Cultivate LA 2014! This is such an amazing event that not only brings together California's leading wine and food makers but also unites the nations top chefs and foodies for an amazing cause! Chef ambassadors this year include Curtis Stone, Duff Goldman, Eric Greenspan and Ricardo Zarate. The event will take place October 11th 2014 in Los Angeles and tickets are still available. Check out http://www.unitedfriends.org/news-events/cultivate-la/ for more information on the star studded event as well as the great work of United Friends of the Children! The new packaging has finally come in and we could not be more excited about it! A HUGE thanks to Ali Stricklin at The Stricklin Studio (Ali@thestricklinstudio.com) for all of her tireless hours and vision in helping us to get it right. We are all done up with nutrition labels, UPCs and fancy designs. This new packaging will allow us to target many more of your favorite gourmet specialty food stores as well as the big boys like Whole Foods, Bristol Farms and Gelsons. Keep your fingers crossed! 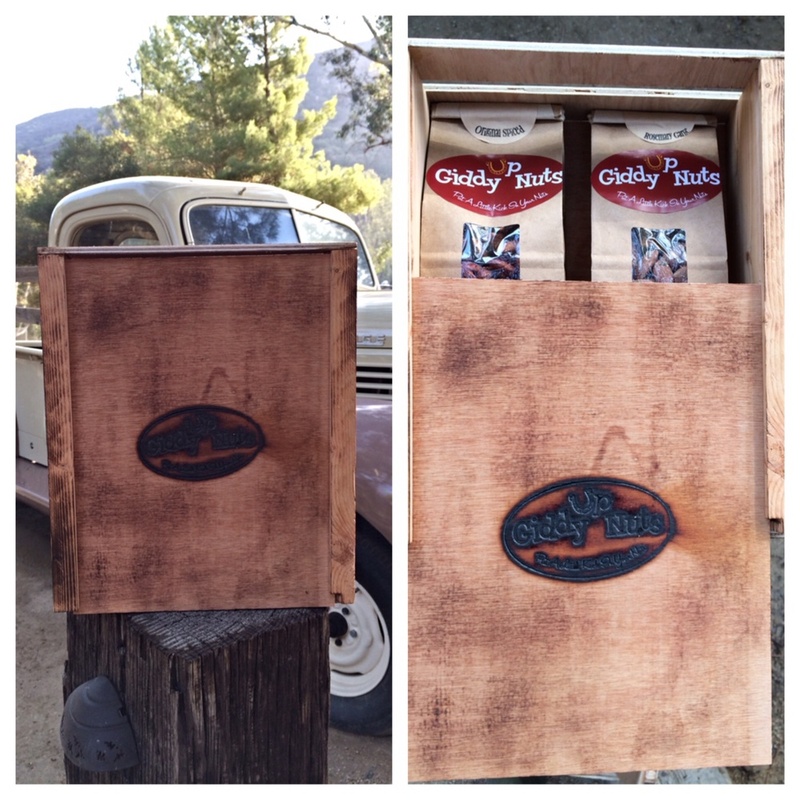 Let us know what you think and look for the new packaging in your favorite Giddy Up stores. "Do one thing every day that scares you"....I received an email this morning with this subject line and I think that they are definitely words to live by! Starting a company is certainly sometimes scary but taking that leap to decide to live and die by your company full time is completely terrifying. For this year's 4th we headed up to Mammoth, the beautiful place where the idea of Giddy Up was born. Its easy to get caught up in the day to day and let what you really want fall by the wayside. When you have a full time job and everything else that comes along on the side in life it gets near impossible to take a second to ask yourself what you really want in life. Even harder to actually find the time to pursue those passions! 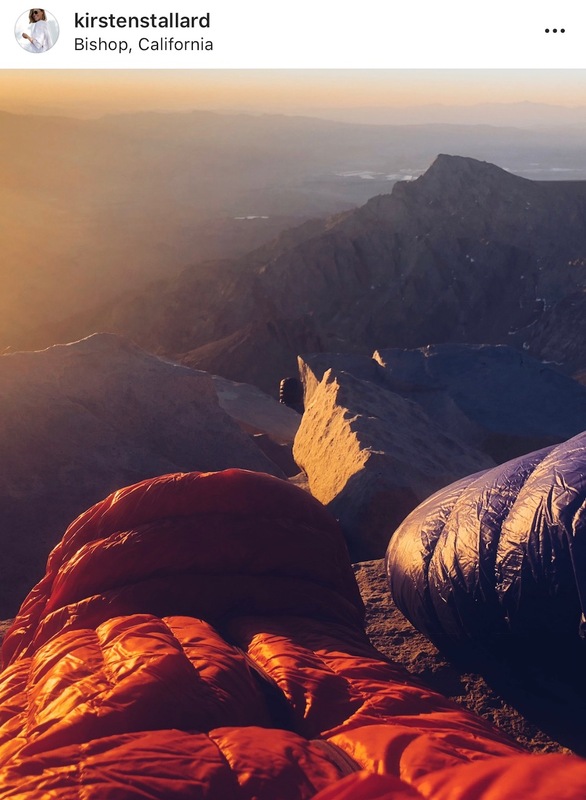 But being up in that magical place above 7,000 feet renewed the entrepreneurial spirit and a pact was made this Independence Day weekend that by the end of summer (maaybbee beginning of fall) Giddy Up Nuts will become the full time gig. Then it will really be Independence Day! Huge risk? Yes. Completely terrifying? Yes. Going to be totally worth it? Hell yes!! We have been working on some new labeling that should be making their debut next week and that means that the pitches to new retailers can start happening in full force. Things are about to get really exciting so stay tuned, lets Giddy Up! Come and find the nuts at a brand new location! You can now find your favorite Giddy Up Nuts flavors at Urban Radish located at 661 Imperial St, Los Angeles, CA 90021. It is the cutest little grocery located in the Arts District in Downtown LA that specializes in fresh, local foods. Check them out! Its that time of the year again! The lights are starting to go up, candy canes line the isles and everyone starts thinking about the perfect gifts to give. We have created one of a kind custom crates for our nuts that make perfect hostess gifts or that will delight the foodie on your list. Choose from the stackable crate or the flat crate with sliding lid; each hold four bags of your favorite nuts. 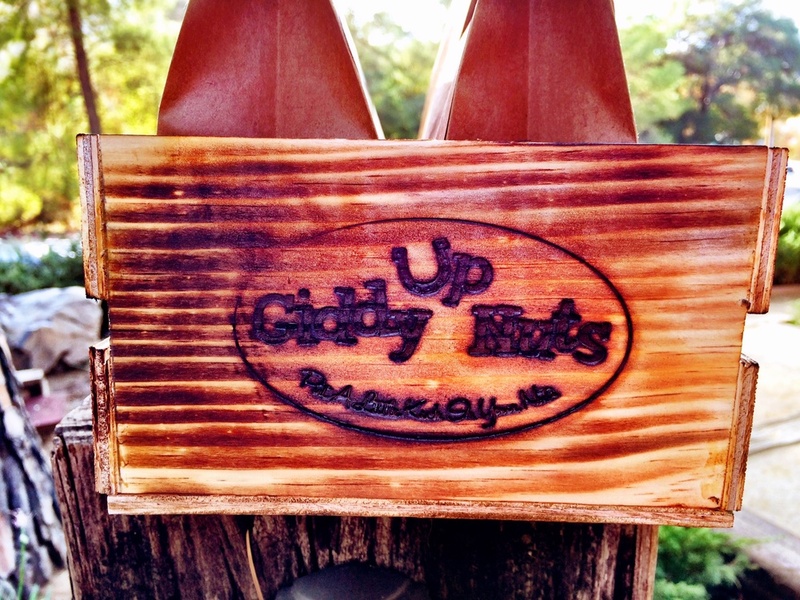 Let Giddy Up help make your shopping a little easier with these unique crates and visit the online store today to place your order. It is rare that we get weekends to just relax and not have farmers markets, events or stores to visit. This weekend was an exception though and we spent our spare time dreaming up new flavors of Giddy Up Nuts and new ways to use them. This was one of our best creations from the lazy weekend. Homemade Giddy Up Mocha Ice Cream with chunks of Coffee Chocolate Almonds. Even though its only two weeks before Thanksgiving you would never know it here in SoCal and this delectable frozen treat helped cool us down and the java packed a punch that inspired us to keep experimenting. Who knows, maybe one day creamy treats will make it into our product lineup. For now, here is an idea of what you can do with your Coffee Chocolate Giddy Up nuts! Happy eating! In a heavy saucepan combine the cream, milk, and espresso. Warm over medium-hgh heat, stirring occasionally, until the mixture barely comes to a simmer, about 5 minutes. Meanwhile, in a heatproof bowl, combine the egg yolks, sugar and salt. Whisk vigoursly until the mixure lightens in color and doubles in volume, about 2 minutes. Remove the cream mixture from the heat. Whisking constantly, slowly pour about 1 cup of the warm cream mixture into the egg mixture and whisk until smooth. Pour the resulting egg-cream mixture back into the saucepan, whisking constantly, and place over medium heat. Using a wooden spoon, stir until the mixture forms a custard thick enough to coat the back of the spoon, 1-2 minutes. Do not let it boil. Meanwhile, set up an ice bath in a large bowl and nest a smaller heatproof bowl inside. Pour the custard through a fine-mesh sieve into the smaller bowl; stir occasionally until cool. Remove the bowl from the ice bath and cover with plastic wrap. Refrigerate until very cold, at least 4 hours or up to 3 days. Pour the cold custard into an ice cream maker and churn accordining to the manufacrurer's instructions. Add in the homemade fudge swirl and Giddy Up Nuts during the last 2 minutes of churning. Spoon the ice cream into a freezer-safe container and place the parchment or waxed paper directly on the surface. Cover tightly and freeze until firm, at least 2 hours or up to 3 days. In a heavy saucepan, combine the cream, corn syrup, and brown sugar. Bring to a boil over medium-low heat, stirring occasionally until the sugar is dissolved, about 5 minutes. In a heatproof bowl, combine the chopped chocolate and salt. Pour the hot cream mixture over the chocolate and stir with a heatproof silicone spatuala until the chocolate is melted and smooth. Stirl in the vanilla. Use right away or cover and refrigerate for up to 3 days. Come find us at our newest location, Cornell Winery! Good wine, good people, good nuts. Giddy Up Nuts is officially at the Oakville Grocery in Napa! Come check them out.